Greetings from ALL at Big Table Farm! 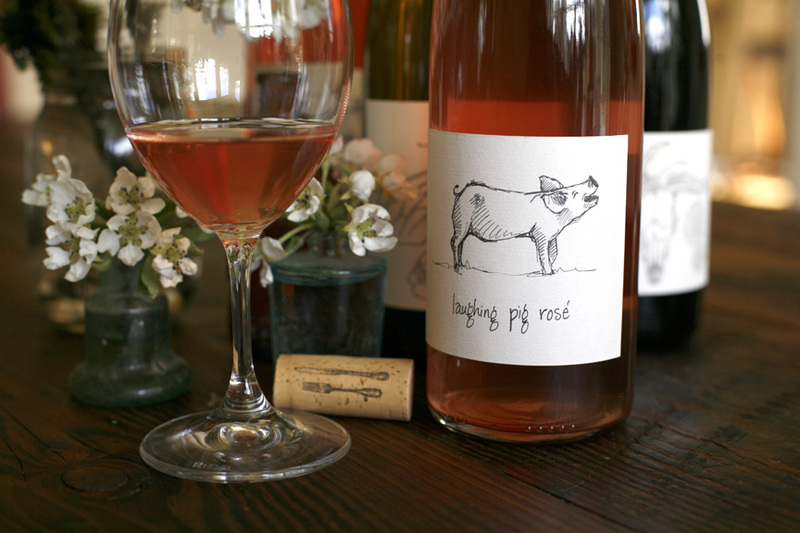 We bottled our 2017 Laughing Pig Rose last week and are thrilled to have a little more to go around than last year. 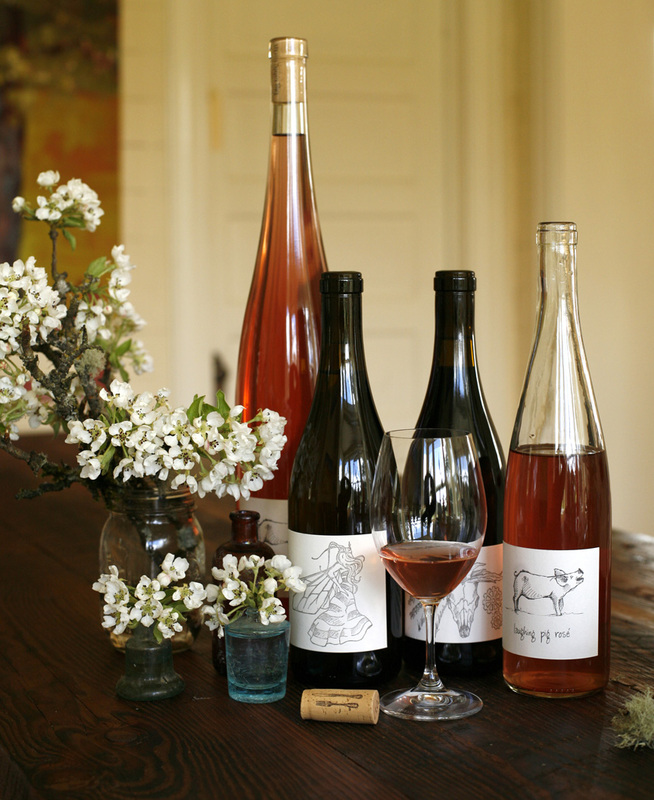 Our rose bottling and release has been happening since 2007 (although not every year) and is an annual marker in time for us, a mid spring ritual that promises the warmth of summer while still in the midst of what this year seems to be a perpetually rainy spring. 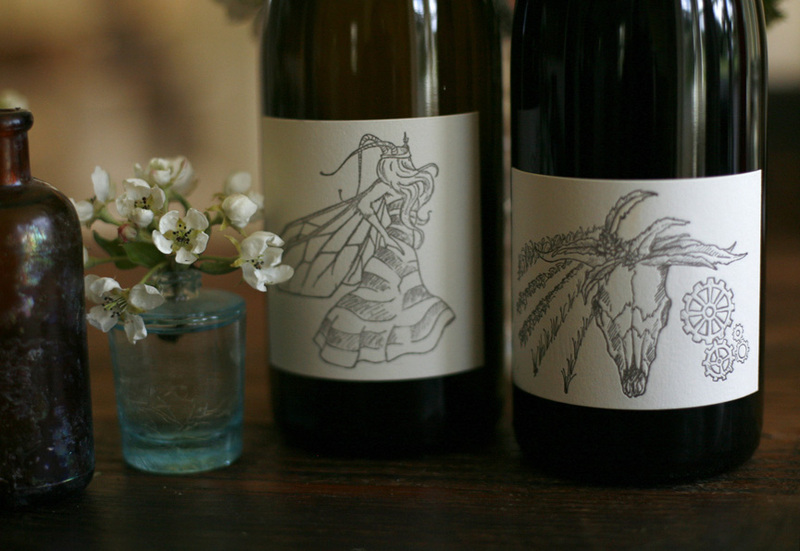 Also on offer are our two barrel select wines, the Elusive Queen (Chardonnay) and Earth (Pinot noir). I continue to joke, but in all seriousness if you don’t buy these wines we will (and we do) drink them ourselves. They represent less than 5% of our production but hopefully capture all of the best magic possible from the vintage. I do the heavy lifting of tasting all the barrels and narrowing, then clare helps me select the final barrels that end up in Earth and the Elusive Queen, so they truly do represent our taste, and our very best! Please remember ground shipping is included on case orders. Since our last missive in early March only a little has changed here on the farm. We have had a cool and rainy spring so the cows are still in the barn, and noisy as hell, as they are ready to be outside. Although the grass is starting to grow, the pastures are still too wet to let them out. Clare has ordered her chicks, both layers and broilers, scheduled to arrive April 19, via US post… for real! The post office will call us at 6AM to tell us the chicks have arrived, many of our neighbors do this too because when you go into the post office the noise of all the chirping day old chicks is deafening! I have started some of my seeds for the summer garden and still have more on the docket, once I get my greenhouse fixed. Levi and Clementine chased a squirrel into it and blew out the whole back end – huzza – there is always something! Bob the cat is still with us and has started to leave us “gifts” on the front porch. Goateo is also still with us and Clare’s horses are good too, although apparently Hummer is almost 30 and only has three teeth, so now gets special mushy senior horse feed. I only know this because Clare has been traveling quite a bit and their care (read scooping poop) falls to me when she is gone. New pigs are chosen and should be here any day now. We have had several suggestions for names but it seems only fair that we should meet them before they are christened. We are still amazed and so grateful for the success of our Oregon adventure. Thank you so much for buying, drinking and sharing our wines. We are humbled and honored to be part of your daily meals and celebrations alike. Don’t forget – ground CASE shipping is on us! If you're super busy - please let us help you order wine in whatever way is EASIEST for YOU! We are happy to assist. Call, email - Clare and Elaine are available to make sure you get the wines you love! If you want to reach out please just send an email to admin(at)bigtablefarm.com or call 503.662.3129 - and we'll follow up with YOU and get your order!